Published on 18 Mar 2013 at 8:42 pm. Facebook’s News Feed is changing. Want to know what this means for users? Curious how this may affect your brand? We’ll let you know. Facebook’s new design for the News Feed. Facebook’s News Feed is the first thing a person sees when they log in to Facebook. This makes it the most used feature in all of social media. Today Facebook announced that they are making some changes to the experience. Facebook feels that the News Feed is a personalized newspaper. News Feed is successful because it supports a broad range of content. They compare it to other social media networks that are only successful if they limit themselves to a simple feature. Facebook learned that the best way to enhance the News Feed would be to enhance the stories it can handle. To do this Facebook needs to support larger photos and videos, and a longer description. They also should link to the publisher a story links to. This is very like Twitter Cards on Twitter. Facebook did not announce whether this would need new markup like on Twitter. Checking in to a place will now bring up a map. Facebook felt that if a user was going to put in the extra effort to check-in then that they should draw attention to that detail. If multiple friends share the same article the image or video they will give that article more prominence. Your friend’s photo will show up next to the large image/video. Hovering over that friend will let you know what they said about that event. Facebook will sort these feeds based on your typical behavior. The Following feed displays stories in chronological order. This means that you are not going to miss an article from a publisher. The navigation on the left of the desktop now matches the design on a tablet or smartphone. This change creates a consistent design inside of Facebook. The desktop design is now responsive. They found that 35% of desktop users did not have access to the chat sidebar. With this update you may now hear from friends that you have not heard from in a while. 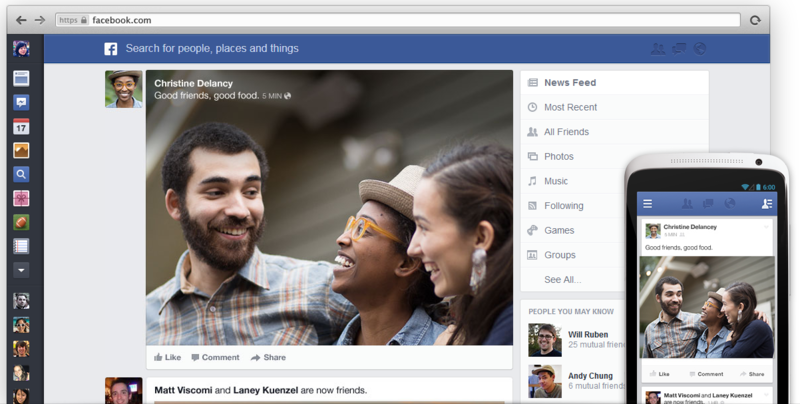 Facebook will start to roll out this design on the desktop today. This will not go out to all users at the same time. Mobile users will experience the design changes as they roll out new versions of their various mobile apps. This post was originally published as Facebook’s News Feed Update for The BrandBuilder Company.